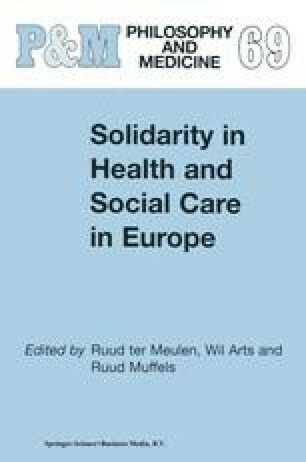 In his chapter on solidarity, based on the theories of classical and modern sociologists, Van Oorschot (1998) defines solidarity as ‘an actual state of interrelations between individuals, groups and the larger society, which enables the collective interest to take priority over the interests of individuals or sub-collectivities’. In doing so, he seems to rephrase Durkheim’s organic solidarity. The Dutch health care system may cause one to wonder if such a definition enables us to grasp what solidarity really means. In our view, it makes the existing solidarity arrangements only partly visible. It takes solidarity on the macro-level into account, but not solidarity on the micro level, with regard to the delivery of informal care. Parts of this chapter were first published in the International Journal of Social Welfare, Vol 9, No 4, 2000; 250–260, published by Blackwell Publishers Ltd.